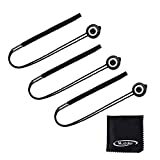 3 x Camera lens cap holder for DSLR camera. An easy way to help you avoid the loss of your lens cap. Elastic band stretches to fit snuggly around the circumference of your lens. Compatible with all type lens cap. Application: all type screens for cameras, phones, iPad, etc. Fit size for storing and protecting your small merchandise. Easily to keep it close with the drawstring. This entry was posted in Discount Photography and tagged Black, Camera, Canon, Cleaning, Cloth, Fujifilm, Holder, keeper, lens, Mudder, Nikon, Pack, Panasonic, Sony, Velvet by Ball Photo. Bookmark the permalink.